The hub of the legendary Silk Road of ancient times is endowed with world's richest treasure house of Buddhist sutras, murals and sculptures, all of which can be seen on this private Dunhuang tours packages. The magnificent Mogao Grottos (Caves of A Thousand Buddhas) will amaze you, as will the beautiful Echoing-sand Dune and the Crescent Lake. As well as the fine views a camel ride will give you a first hand experience of what it was like when caravans plied the Silk Road. This is a truly extraordinary tour that is steeped in historic traditions. Here we offer an opportunity for you to visit the Obvious Pearl on the Silk Road. 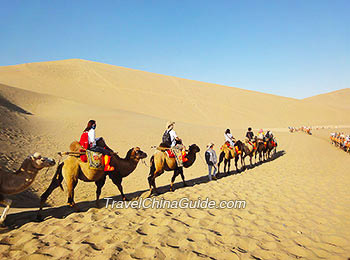 This private 3-day Dunhuang tour itineraries includes the city's landmark, the Mogao Grottoes with the artistic features of the treasured Buddhist murals, and a short camel-riding along the Echoing-Sand Dune to reach the Crescent Lake. 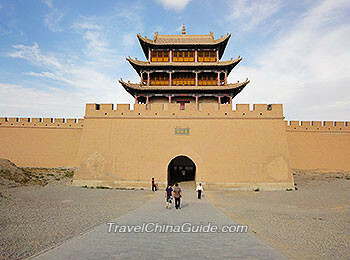 Following this Dunhuang and Jiayuguan trip, you will take in spectacular desert scenery by visiting the Echo-Sand Mountain and Crescent Lake, appreciate elaborate Buddhist grotto arts at the Mogao Caves and Yulin Caves, and climb up to the Jiayuguan Pass which has stood in the vast desert for hundreds of years. 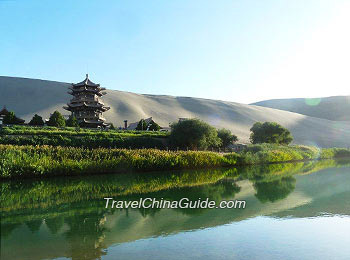 The magnificent sea of sand at Echoing-Sand Mountain and the scenic Crescent Lake would offer you great natural views. 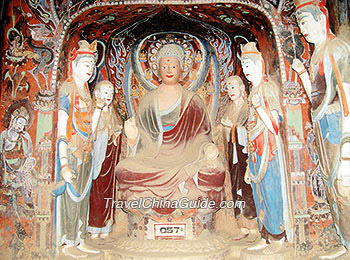 Moreover, the Mogao Caves, which is famous for beautiful Buddhist murals and statues, will add more value to the trip. During this guided Dunhuang day trip, you will enjoy a gorgeous visual feast by viewing delicate frescos in Mogao Caves, precious cultural relics in Dunhuang Museum, and spectacular natural scenes in Echoing-Sand Mountain & Crescent Lake Scenic Area. For more tour packages, please click Hiking Adventure, Bicycle Routes. I like to see the Dance show in Dunguan. Is this show still in the Dunhuang Hotel? Do you mean Dunhuang Celebration? This show is still available in Dunhuang Hotel. For your reference, the seats are divided into five blocks, so the prices are CNY 588 for VIP blocks, CNY 318 for A blocks, CNY 268 for B blocks, CNY 238 for C blocks and CNY 198 for D blocks. Please advise most convenient method of travel from Urumqi to Dunhuang and back to Urumqi. The most convenient way is to take the bullet train (about 5 hours) from Urumqi and arrive at Liuyuan railway station, which is a little far from Dunhuang downtown. Then you can take a bus or taxi around 1.5 hours to reach the city. I'm trying to book the ticket through the online portal. However, it requires a Chinese phone number to open an account. Are there alternative method to reserve tickets through the online portal? Yes. Most of online bookings need to be signed by a chinese phone number. You can buy one Chinese number with your passport. Hi! Is there a night bus from Jiayuguan to Dunhuang? My Dad and I are traveling through on 19-June (2017) and the train seems to be a little too short to get a night of sleep. Also, does anyone have recommendations for an English-speaking driver who could meet us at the train when we arrive, take us to all the sites, and drop us off at the bus or train? How much should this service cost? As I know, there is no night bus from Jiayuguan to Dunhuang. They are all operated in the daytime and the ride takes around 5 hours. With regard to the driver, most drivers in China do not speak English, I would suggest you take a guided trip with a travel agency to show you around. Hope it helps. I plan to visit Zhangye Danxia Landform Geopark on November 3. Do you have any information where I can rent a car for one day tour? Kindly be informed of weather forecasts, is it comfortable and is the mountain looks nice on November 3? Do you travel from Zhangye to Danxia Landform Geopark? You can take bus from Zhangye West Bus Station bound for Sunan and get off at Nantaicun,then walk to the park. If you want to view sunrise or sunset, then charter a car is the only choice. You can find a local travel agency or consult your hotel for help upon arrival. Or you may find a taxi driver to take you there. The fare is around CNY200 for round trip. It is getting cold in November but the view is still nice at that time. Hope you have a great time.